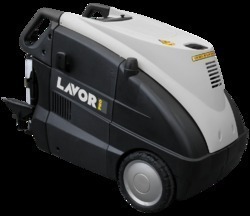 Leading Manufacturer of steam jet car cleaning & wax system, lavor gv etna electrical steam generator and lavor-kolumbo steam washer & cleaner from Coimbatore. STEAM CAR WASHER uses steam jet to wash and clean car’s exterior and interior. Steam jet is completely safe on car surfaces, smoothly removing the hardest dirt from car surface. With special additional Ozone, Vacuum and Hot Air features, this is not just a regular Steam Car Wash System; it is complete car care equipment. Whereas Steam and Vacuum ensures cleaning of the vehicle, the highly effective Ozone generator sanitizes and deodorizes the car from foulest smell and germs/bacteria’s. The most special feature of steam car wash is its eco-friendliness. It takes very little water (Less than 4-5 Liters per vehicle by average), and it does not cause any wastewater run-off. Steam’s washing power is truly amazing. You will be astonished to see what it can achieve without any chemicals. Our STEAM CAR WASHER is specially designed to wash and clean cars safely and efficiently. Our STEAM CAR WASHER is virtually mobile, and it will give you the freedom of conducting your cleaning tasks whenever, wherever you want. Carwash is a machine designed for the care and cleaning of car interiors. The power of steam, hot air and a wide range of accessories allow a complete treatment of the car’s surfaces. The vapor is effective to clean and brighten seats, leather upholstery and treat the most difficult places to reach. The jet of hot water /detergent dissolves the stubborn dirt. Purify The Passenger Compartment With The Ozone. Generates high-pressure steam using only 400cc (130z) water per minute, generating No wastewater, NO sewage. System consumes less than 200-Watt power and minimum fuel. Just the adequate amount of pressure and moisture. STEAMJET is commercial grade equipment that can run all day non-stop. All stainless steel and rust proof structure. Fully CPU controlled with 8 different phases of Automatic safety features. 28 levels of steam moisture control depending on dirt level. Well- modulated system can diagnose and troubleshoot over the phone. The same remarks about pressure and delivery rate made for high-pressure cleaners, have to be taken into consideration also for steam generators; in this case, the important difference is the physical relationship (and so not subjective or debatable) that exists between steam pressure and its temperature: to a fixed pressure values correspond right and univocal temperature. Knowing these values it is easy to identify the ones (like us) who show the right double relation between pressure and temperature. Outlet steam temperature (not boiler temperature, that is higher) is important because there are natural limits (about 140°C) under which it is not possible to talk about sanification and so the purpose that led to the machine purchase (clearly wrong) could be unattended. With the high-pressure cleaner it is not possible an indoor washing, unless there is a filled in collection system, instead it is necessary to move the washing phase outside; with the steam generator it is not necessary to move outside, it is possible to wash the part exactly where it is, because the water generated can be easily dried. Steam at 180°C allow to degrease dirt also without the use of heavy chemical products. The danger of chemical products used is generally proportional to the effectiveness against increasing dirt tenacity. If we wash with the high-pressure cleaner we produce from 10 to 21 litres of polluted water, that must be collected and drained following the current regulation: in a single wash of a couple of hours 2,5 tons of dirty water is produced! If we wash with a steam generator, the most powerful machine produces 37 litres per hour, with the most part of the liquid that evaporates, with a two hour wash the remaining dampness and disinfecting product is very low! Analyzing all these subjects, the steam generator is more advantageous of a high-pressure cleaner. Steam can be considered water with a related dampness very, very low (superheated steam is just hot air and itdoesn'thave a significant mechanical action…), with an outlet temperature much higher (180°C) than a high-pressure cleaner: this means that the mechanical power is lower than the one of water, but the degreasing power of steam is much higher.